Very good article in deed. However, there are mixed up and can you plesae work on the flow? Good article.Well recollected and well put. Very nostalgic! We will be at the stadium again on 26th to support “the greatest clubs on earth!” GOR BIRO, YAWNE YO! wow,this is very interesting to learn.i now recall one day when i was a small gal,my dad coming home with torn muddy clothes after a match between the two teams!!! !kudos pacho,as much as it aint flowing am happy i got the message.thanks,will definately be at the stadium. 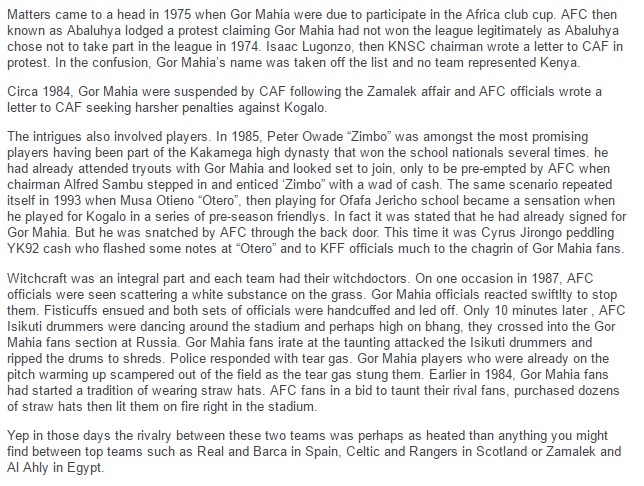 That was the days when football was made by Gor Mahia. Anyway hoh can i get a vidio or CD of the Finals between Gor Mahia and Experence of Tunisia? this is simply great piece of work. Great piece indeed. 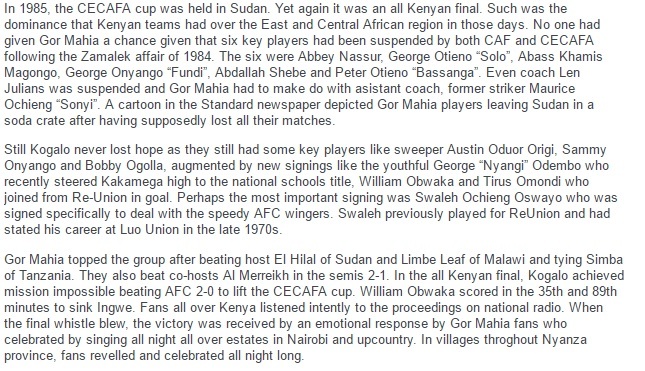 I fondly remember the day Gor beat AFC in Sudan. 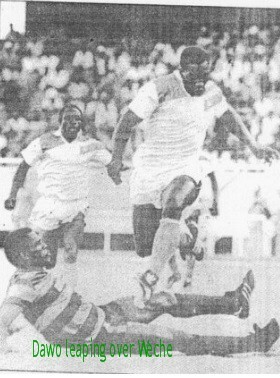 It was around 8.00pm when Obwaka scored the second goal and I was in class 5. Another good piece if that of Jared Achieng Achieng, man this kind of articles should be given to the team for them to have that fighting spirit in them which they lack. Am in tears reading this. 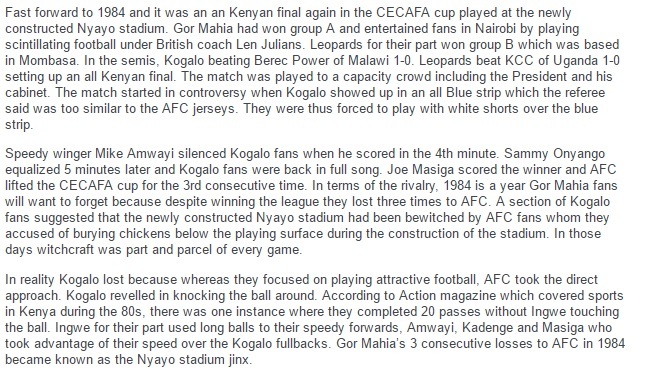 I can remember the Gor Mahia vs AFC game in Khartoum. I was in high school form 2 to be exact only 14 years old and we were listening to the game over a small radio at night in low volumes in our domitory with the lights out. My buddies were AFC fans and you can imagine when we won, i slipped silently and laughed in happiness under my blankets. It was the best night of my life in school ever and the worst for my buddies. Obwaka did us proud. Jo Kogalo, let us all UNIT and turn up in large numbers to chear our team win against our bitter rivals AFC Ogwang’. PLEASE, PLEASE, COME ONE COME ALL and we shall win sing Gor biro yaw ne yoo tune at Nyayo Saa Moja Kamili. Tuko game lazma leo ispokuwa the club scouts behave like they own both teams regardless of tribe i support Kogallo!!!!!!!!!!!! 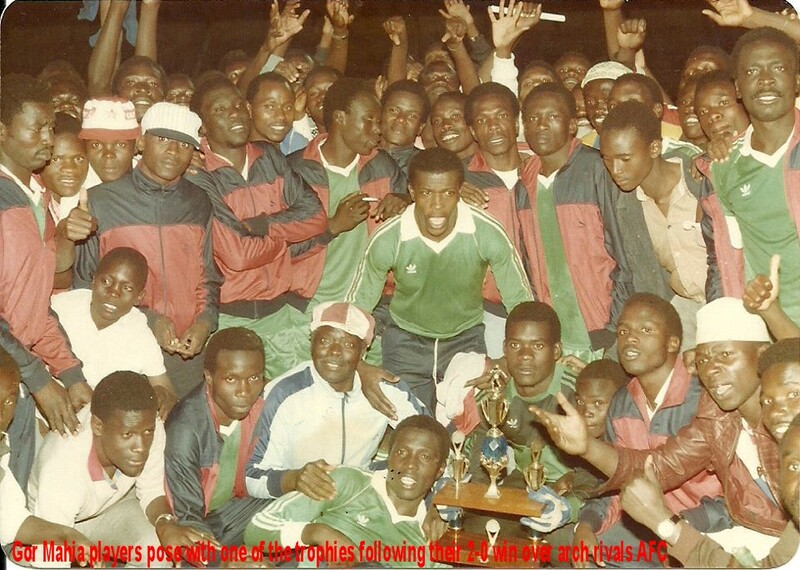 zico” lets back 1990s if we can remember what Zedekia did to Gor Mahia the match between Gor vs Nzoia at city stadiam moi Golden cup,Zedi was given money by the Nzoia side to lose the game and he did it,after roll we lose that game to Nzoia 2:0. So a win at last but that is not enough. Let Zicco show those Boys how to pay Conner bolls and Free kicks I think we will get more goals from them. We don’t want the Arsenal type of game we want goals Zicco, Blackberry and any other player who is striking. The club owner has know luck with “Zico” since Zedekia led Kogalo to 2:0 beaten by Nzoia after he was given the money and he realy eaten that money,ihave already focus Zedekia it’s just leading GOR to the grass,question to Rachier how can you sucked awiner and you remine with aloser,which kind of aleader is that and say that you want vai for Agem seat,let me asure nowhere your going to get that seat.Your just alawyor but you dont know how to lead GOR K’OGALO wake up it’s still morning (Zedekia,Ogallo,Arum,Omollo,Ouma)and other confused elements will let you lose Gem seat and leave GOR MAHIA can you remember all OKUDO did to GOR and all that He did to GOR does’nt made him not to left GOR he left it. 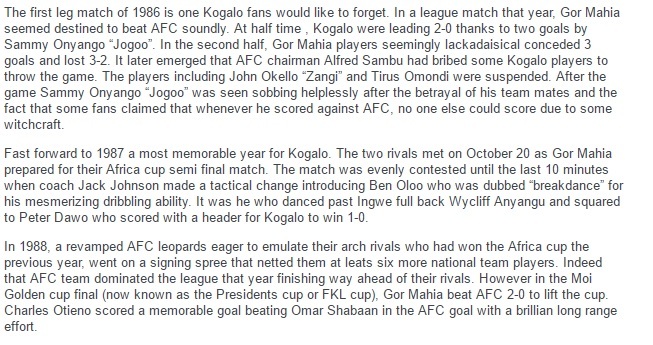 Ingwe has always eaten Gor. I am shocked at the lies! CAN THE BE PEACE BTW GORE AND AFC.I LOST A FRIEND IN OUR LAST MUCH”PLZ ONLY LOVE CAN GONGER HATE. CAN THE BE PEACE BTW GOR AND AFC.I LOST A FRIEND IN OUR LAST MUCH”PLZ ONLY LOVE CAN GONGER HATE. ITS TIME FOR GOR FANS TO GROW UP. USE OF FORCE WITH OR WITHOUT A TICKET IS COUNTER-PRODUCTIVE. 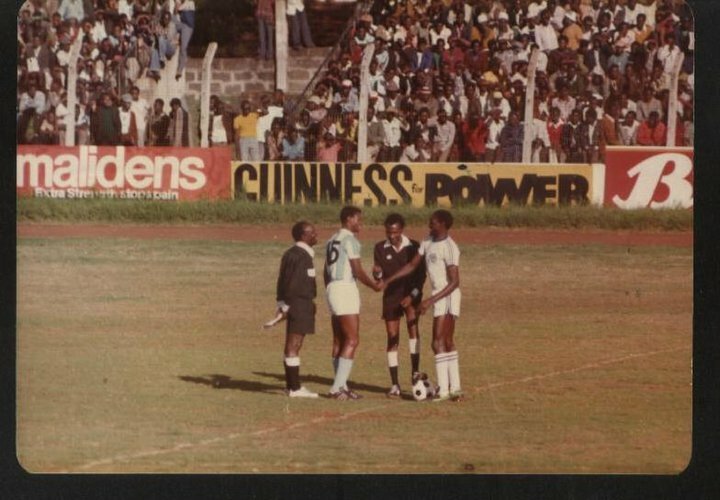 football in kenya was football when the 2 giants were based on tribalism these brought fighting for sepeoriority and could only be prooved by beating the other. MASIGA,MURILA,MULAMBA,MUSUKU,ABBAS,ARIENO in AFC & OGAOLA,BASSANGA,LULE, ODEMBO,JOGOO,KAMOGA. the players we really mis. This a good interactive forum. Let us give Mr Rachier his space to run the team and coach Zico courage to handle his technical resposibilities. 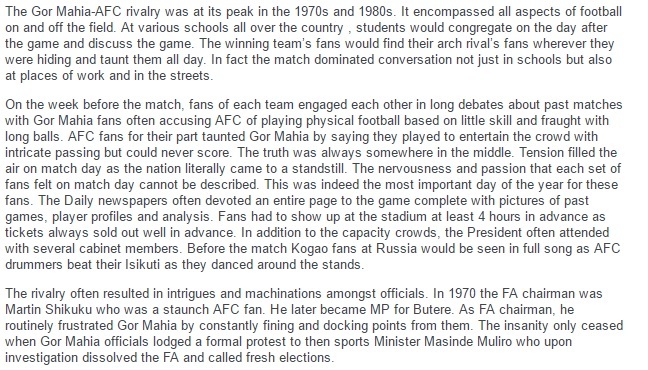 A very good piece of interesting information about the two Kenyan football clubs. ok awinj maber juogi loso sama kogalo nie web kata otal nyinge. How many games has Gor won against AFC and AFC likewise ?